Dragonets are members of the Callionymidae family, which contains approximately 19 genera and 139 species. Dragonets are a highly sought after and commonly kept group of fishes due to their interesting behaviors, small size and unique coloring and patterns. 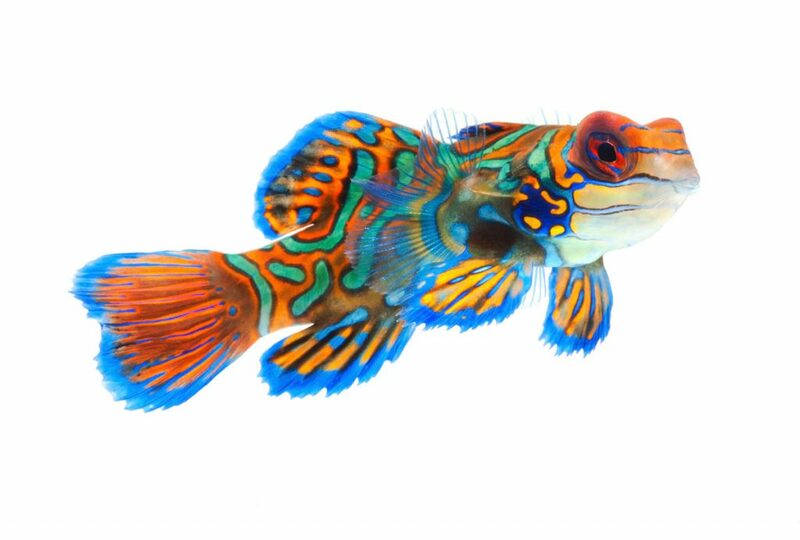 The Mandarin Dragonet (Synchiropus splendidus) is one of the most commonly sold dragonet species. Other commonly sold dragonet species include the Spotted Mandarin Dragonet (Synchiropus picturatus), Ruby Red Dragonet (Synchiropus sycorax) and the Red Scooter Dragonet (Synchiropus stellatus). Dragonets are a highly diverse family of fishes, found primarily in the tropical Indo Pacific. They can range in size from 1” (2.5 cm) to 12” (30 cm), however on average they tend towards the smaller side of the spectrum. Dragonets are benthic fishes, spending their day scooting across the substrate and through rock crevices in search of zooplankton such as copepods and mysis. Male dragonets will display at one another with their dorsal fin to communicate aggression. Their highly ornate dorsal fins are also used in courtship to attract and impress females. Dragonets spawn at sunset, by rising briefly into the water column and shedding their gametes together. Dragonets can make great aquarium inhabitants, provided their husbandry needs such as diet, water quality and tank space are met. Dragonets have a highly specialized diet, and it is essential to provide them with sufficient live foods while they are being trained to eat prepared foods. Many people report success using frozen copepods to transition dragonets to captive diets. Dragonets prefer a temperature range of 72F (22C) to 80F (26C). Dragonets are generally considered reef safe as they will not harm corals or ornamental invertebrates. Dragonets are relatively small fish and can do well in smaller reef tanks, provided ample food is available. Dragonets can display aggression towards each other, so it is best to maintain them in male/female pairs or as individuals.